The Best of The Muppet Show: Volume Seven collects three random episodes of the series, along with a scant amount of bonus features. Though Columbia TriStar Home Video’s reluctance to release these episodes in their proper order is baffling, there’s no denying that their appearance on DVD is something worth celebrating. 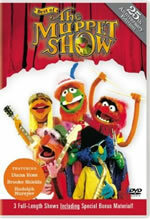 The first episode stars Diana Ross as the guest host, and features the following sketches: Copacabana Song, For the Birds, Gills Brothers, Beaker Sings, Diana and the Band, and Diana and Fozzie (as well as a few other unlisted sketches, including a brief but always welcome Pigs in Space bit). Because of Ross’ presence, this episode is packed with songs; thankfully, the muppet gang liven up the numbers with their expectedly oddball antics. The obvious highlight is a truly bizarre sketch that features Beaker singing - in his distinct, non-speaking manner – a rendition of “Feelings” that is arguably better than the original. Next up is an episode with Brooke Shields as the guest host, in which the following sketches are performed: Alice Falls, Caterpillar Scene, Smiles Medley, Jabberwocky, The Trial, and Tea Party Finale. The running theme through this episode involves the story of Alice in Wonderland, which is performed by Shields and various muppets. The young actress was only 15 at the time, making her the youngest person to ever host The Muppet Show. She does a fine job, and though there are no exceptional sketches here, this is a decent episode. The final episode on the disc features Rudolph Nureyev and the following sketches: Culture, Pig Opera, Swine Lake, Incomplete Guy, Steamed Up, and Dapper Finale. Not surprisingly, Nureyev spends the majority of his screen time dancing – either alone or with muppets. This is clearly the weakest episode in the set, though there’s something oddly compelling about the Swine Lake number – a ballet performance featuring Nureyev and a dancing pig. The Best of The Muppet Show: Volume Seven collects an eclectic assortment of episodes, and should easily please fans of the series. Audio: The Best of The Muppet Show: Volume Seven is presented with a Dolby Digital soundtrack which accurately reflects the limitations of the era from which it originates (meaning it gets the job done, but will in no way knock your socks off). Video: Ditto the full-screen transfer, which is remarkably clean given how old the source material is. Extras: Each episode is preceded by a short introduction from Brian Henson, in which he offers up a bit of trivia about the show. The disc also includes short supplements entitled “Muppetisms” and “Movie Mania,” in which Kermit and Fozzie make newly filmed appearances. There’s also a production sketch from the Nureyev episode, along with several trailers (Baby Geniuses 2, Annie: Special Edition, Mathilda: Special Edition, and Daddy Day Care). Conclusion: While the extras leave something to be desired, there’s no denying the niftiness of seeing The Muppet Show on DVD.